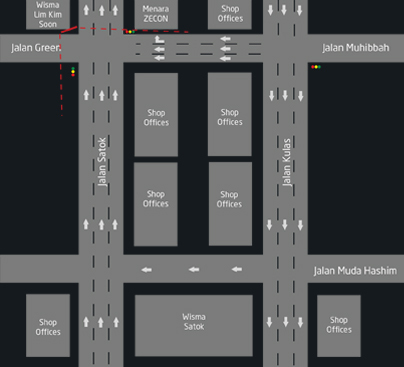 This screen is located along Jalan Satok and parallel towards the opposite direction of Jalan Kulas where between these two roads lays the main commercial and financial area of Kuching with major bank institutions such as Maybank, RHB, CIMB, Ambank, BSN, Bank Islam and Kuwait Finance House. Also located here are the telecommunication operators such as Maxis, Celcom, Digi and other local businesses as well. The area is about 2 kilometers from Kuching City and Jalan Satok connects the city centre to the nearby busy Satok Bridge across the Sarawak River which can access to Petra Jaya, the Administrative Centre of the Sarawak Government.